Spring cleaning is a great chance for you to show your little small abode some good ole’ TLC. So I took full advantage of this time to re-evaluate my entire home. The first part I wanted to focus on was my wardrobe. Hiding in your closet are items of clothing that you like, but haven’t worn in awhile. It’s tough letting go of things you like, we know! But storing things that aren’t used really makes no sense if you live in a Small space. So open those drawers and try some of those old clothes. If they don’t spark joy anymore as “KonMari” mentions, then it’s time to donate. Plus you will feel better wearing every single item in your wardrobe regularly! 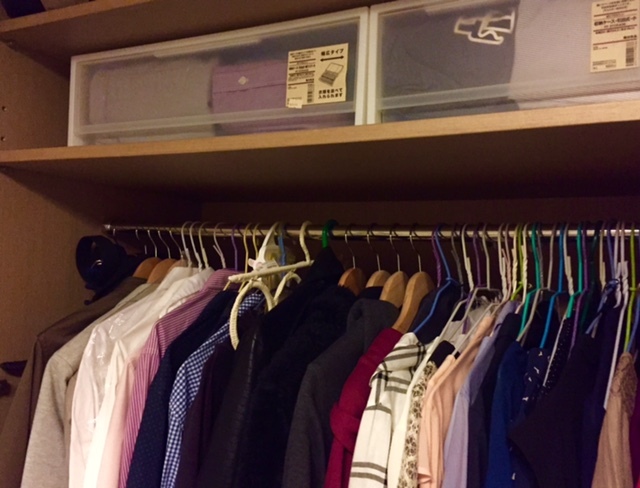 If you have a hard time getting rid of stuff, try the inverted hanger trick. 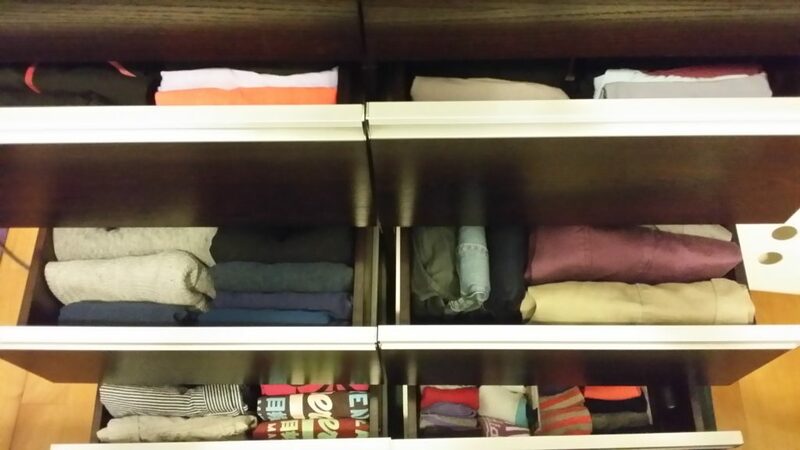 Wardrobe organising tip 2: Fold your clothes the “KonMari” way! If I can fold it, I will fold it. Hanging clothes that don’t need to be hung actually takes up a lot of space. Once you learn how to fold your clothes well, this clears up so much hanging space for heavier and bulkier coats! I used to think that these are pointless, but boy was I wrong. These things bring extra order to your drawers! If you think of dimensions alone – tank tops, socks, and skirts when folded are of different sizes. These adjustable drawer dividers are the best because of their flexibility. 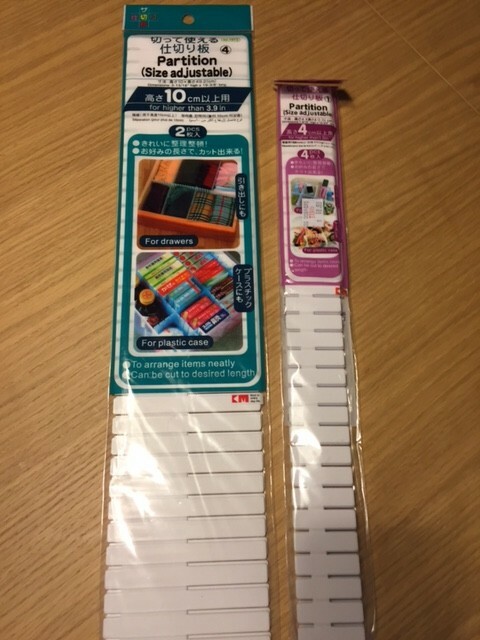 You will find these in Aeon, the little local department stores and one of my personal favorites, Living Plaza. With your mastery of folding clothes, you’ll know that folding and storing things into drawers work really well and save a lot of space. 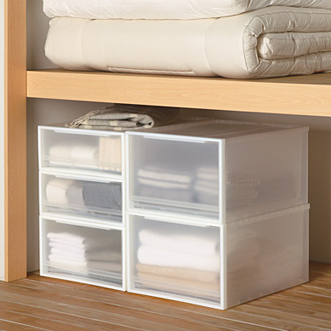 We recommend drawers from Muji as they come in dimensions suitable for Asia, are of great quality and look great! There are many sizes, so you can even place them inside your wardrobe for extra sets of drawers! Don’t leave them empty. So those special occasion dresses and extra winter jackets can be stored under your bed, while those special shoes can be put in your suitcase and placed up on the highest shelf of your wardrobe. As airtight as these things seem to be, they ALL leak air after 4-5 months. So take’em out and VROOM away. Maintaining the thin profile of these bags, maintains your space. Hang the clothes you’ll definitely and regularly wear for the season and keep the number of items out, with how often you do laundry. Trust us, a rotation of clothes is very efficient, space saving and time-saving too. For obvious reasons, this just helps you find your clothes in a snap! There you have it – our wardrobe organising tips for small bedrooms.